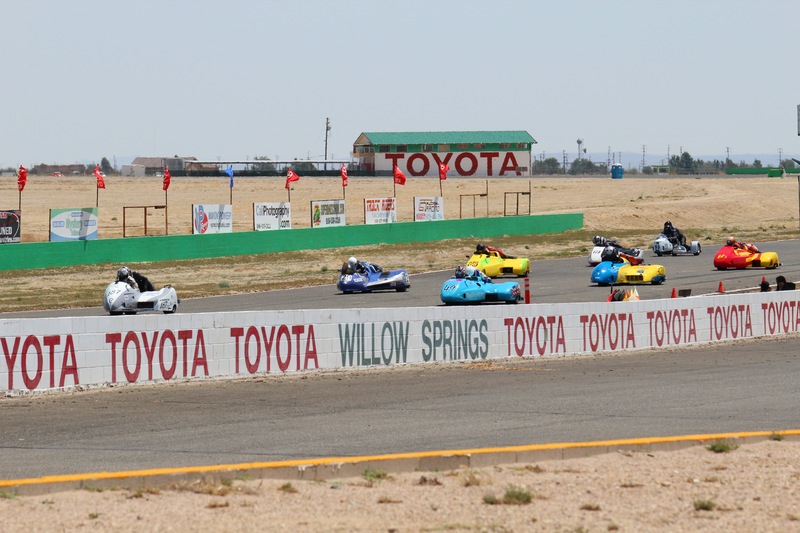 This was possibly our most successful outing at “The Fastest Road In The West,” Willow Springs International Raceway. The funny part is, we had some serious hurdles to overcome at the same time. The main problem we ran into was gearing. When we modified the rear suspension in the off-season it gave us the ability to run a larger rear sprocket (essential for the tight confined of Pikes Peak). However, the rear sprocket we chose seems to be “in between” the sweet spots for the purpose-built tracks we run. Since it’s so hard to change a rear sprocket, we usually just switch between two different front sprockets for tight or fast tracks. We have ended up being geared too short at both tracks we’ve gone to so far. That means the engine is screaming at redline in top gear well before we need to get on the brakes. This deprives us of precious top speed when we are already at a horsepower disadvantage, and it quite simply beats the crap out of the engine for no good reason. Unfortunately, there was not was to fix this because the chain was already rubbing against the bodywork, and a bigger front sprocket would have made it even worse. There is just not a lot of room to work with on this bike. Head down in Turn 1. Photo KIM DURHAM. The other problem was a pretty silly one… a hangover. I don’t know what happened, but that was the worst hangover I’ve had since I was in the Marines. I was dizzy and needed to throw up until almost 4pm Saturday, hours after our first race. Despite that I made it through both morning practice sessions and our lap times looked fine. Since every dollar I have goes into racing, the temptation to make race weekends your vacations can sometimes get the better of you, but this was one mistake I don’t plan on repeating.Saturday’s race was the usual 6-lap affair and we started from the front row. We managed an easy holeshot but Chris Wood of Wood Brothers Racing just motored right up inside us from the second row. He came in really tight though to leave us room and I just took a wide line which kept us in the lead. This is a horsepower track so I knew I couldn’t wait for the tires to warm up, and just immediately gave it everything I could muster. The bike was spooky as hell in the long sweeping turns but we made it work. I occasionally saw Chris in the mirror, which almost always means they are right behind you. We had gained about a 5-length lead after two laps but that’s really not a comfortable margin. We run a 2002 Suzuki GSX-R1000 and the other front-runners have the 2006 version. This is worth at least 15hp more in stock trim and the gearbox is also more race-oriented. This means at a horsepower track like this we would lose 10-15 bike lengths per lap and have to make that up with sheer determination. Truth be told I was having a really hard time seeing where we were going. The bike bounces violently anyway and my head only sits about 24-in off the ground. The resonance of the engine’s airbox also vibrates my helmet, and the lingering hangover was just turning things into a total blur. When I saw the crossed flags for halfway it felt like we had already been out there a half an hour. Worse yet, the red/yellow blur of Becker Moto Works was now mixing with the sky-blue blur of Chris Wood’s machine in my mirror. The ensuing battle for second actually slowed them both down though and I put my mind on fast laps instead of who was behind me. 2 laps later Becker was on our tail and simply motored by us on the straight. Worse yet another machine came around us on the other side! It was Rick Murray, former President of the SRA-West and multi-time champion. 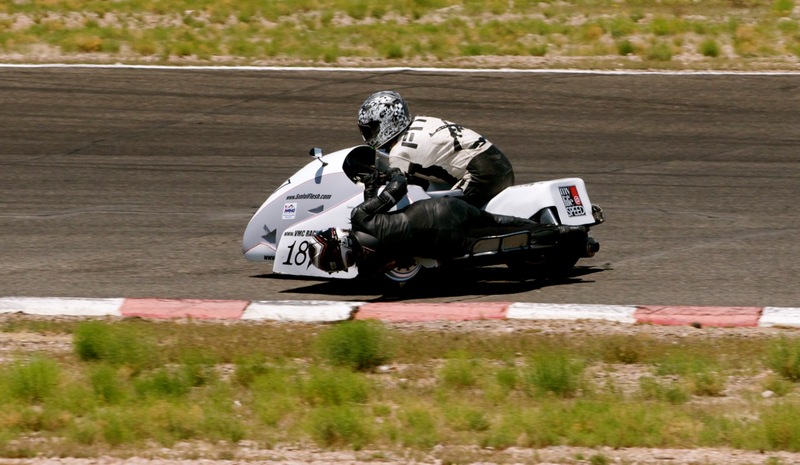 He has been on semi-retirement for over two years, but still makes select events to stay sharp for the Bonneville Salt Flats. By the end of the front straight they were both a speck on the horizon. Turn 3 always makes for the best photos. Photo KIM DURHAM. This was the final lap so I was ready to settle for third, but then something happened in turn 3. Rick Murray caught a huge slide and thought he tossed his passenger, Gary McEwen. As he climbed out of the cockpit to look he slowed. We ran right past him and I could see Gary pounding on the bodywork, trying to tell Rick “GO GO GO!”. The Formula 1 style chassis they run keeps the driver and passenger much more separate. The engine is in the back and the driver is up front enclosed except for his head. Our Formula 2 machine is much different, where the passenger is actually lying on the driver’s back in right turns. It makes it really easy to know where the passenger is, and we went in a last lap charge to get enough space to out-pace them before the checkers. I scared the crap out of myself screaming through turn 9 with all 3-wheels sliding, but we were simply out-motored on the long run to the straight, and still had to take 3rd place. There was little else we could do about power output here at the track. The gearing was off and any power- adding would not affect top speed. We ponied up the extra $$$ for the 100-octane VP race fuel hoping for a little boost, and I settled in to some much deserved sleep. Tomorrow is another day. True to form Sunday I felt awesome after 10 hours of sleep. The ever-present wind of Willow Springs was a dull roar and, more importantly, was blowing in the opposite direction. This is record-setting conditions. I concentrated on the start this time and got a holeshot, settling into first and simply charging as hard as I could from the outset. I have no idea what the gap was, but it was the sky-blue of Chris Wood once again, but perhaps a little further back. Holeshotting the field on Sunday. Photo STEVEN FOOSHEE. Gina has turned a corner this year. Her timing has become impeccable and her ability to sense oversteer and understeer is in a new realm. I want to remind readers that Gina has no racing background at all. She has never done a racing school or a track day. She has never owned a motorcycle, and has only ridden one a handful of times. My vague directions and constant complaining are all she has to go off of, and in just over a year now we are setting new lap records for the bike. I mention this mainly to preface how important a passenger is. They are really more of a co-pilot. 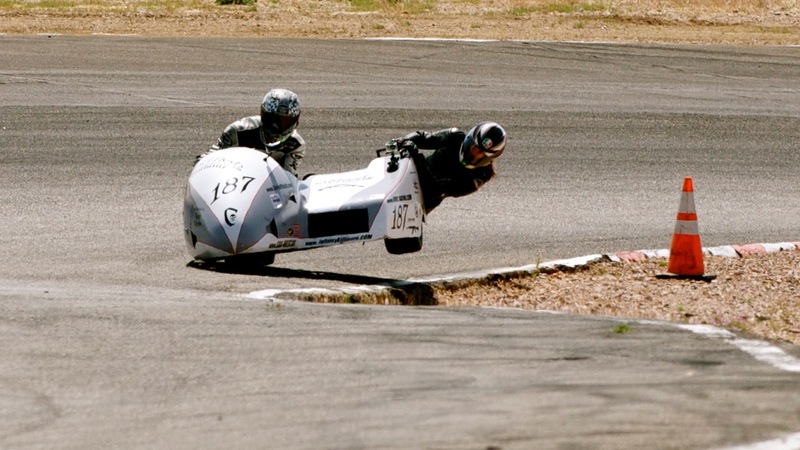 They do not simply jump from side to side in an attempt to keep all three wheels on the ground. More accurately they cast the final vote as to which wheel gets traction. I can’t throttle steer the bike in right turns because the chair wheel is not driven by the engine. If Gina “kicks” the foothold, however, she can break traction at the right moment and cause a slide that rotates the nose of the machine toward the inside of the turn. She can also move forward or back in right turns to give traction to a sliding or spinning tire. This really is a team sport, and I can’t say it enough to the uninitiated. When I put a first-timer on the bike it is INSTANTLY going to take away 4 seconds-per-lap, even if they are naturally gifted with timing. Drop a wheel in a hole that big and you almost guarantee a hospital ride. This is a team sport unlike no other. Photo KIM DURHAM. Okay, enough of that. We’re hauling the mail in no uncertain terms and it’s going so well I don’t even remember Gina is on the bike. That is the ultimate compliment I can give a passenger. If I’m totally focused on driving the bike, never checking my mirrors or feeling a passenger-induced wiggle in the handlebars, I know we are in rare form. Despite this, Becker was gaining on us at the halfway, and was in striking distance almost immediately. I started looking for a weakness, and spent a lap trying the inside and outside of almost every corner. He finally motored past in turn 7. This is the worst sport for us to lose him, since its’ 5th or 6th gear all the way around to turn 1 again. Lap traffic slowed us down in high-speed turn 8 though, and we were right on Becker’s tail coming onto the front straight. When we got to turn 1 there was an 8-10 length deficit though, but we pulled in several lengths on the brakes. We lost a little on the exit, but turn 2 is a long uphill right-hander. Our bike was sliding the chair and rear wheel, while Becker later said he was losing grip in the front. This allowed us to take a very tight line without having to give up speed, and we were back on their tail going into turn 3, the tightest turn on the track. They didn’t know we were back there, so the door was wide opened and we dove in, hard on the brakes. We had to scrub a lot of speed but I was hoping this would work as a sort of check-pass, causing them to lift on the throttle momentarily. Not to be! Becker checked up alright, nice and early, so he could drive up the hill and pinch the inside for turn 4. I wasn’t looking to make friends, so I gave him exactly the width of his bike and tried to get my nose ahead of him before we turned back downhill. Unfortunately the outside of this turn is extremely bumpy. We couldn’t find traction and fell back to second. I knew the fast half of the track was beginning so I put everything into a good exit for turns 5 and 6. Everything went according to plan and we were right on their tail as we crested turn 6 until… DAMNIT! I completely blew the shift into 4th gear. Not only did I blow it, but I must have taken a pound of metal out of the transmission trying to ram those cogs together. By the time I got the gear, we were never going to see the lead again. Becker simply yarded us and I put my heart and soul into the final lap. I could see us making gains, but we were nowhere near at the end, and took another second place. Wrestling the bike back downhill through turn 4. Photo ROBERT DENSMORE. Not to be too disheartened, we did manage to break our team’s lap record at this track, and for the first time ever we were able to lose the lead and make a pass back to attempt to win. Becker starts from the back of the pack, and has a pretty sizable equipment and experience advantage on us, so things have to be put into context. Our Formula 2 machine should be in another class, and running a 600cc engine, scored separately like in automotive endurance racing. Our engine is a generation older and also running its 3rd year as a race engine without any kind of maintenance but oil and filter changes (and a transmission swap once). Still, I am not the type to make excuses and remain focused on my main goal. Dropping lap times and winning races. We will have one more chance to do so in a few weeks. 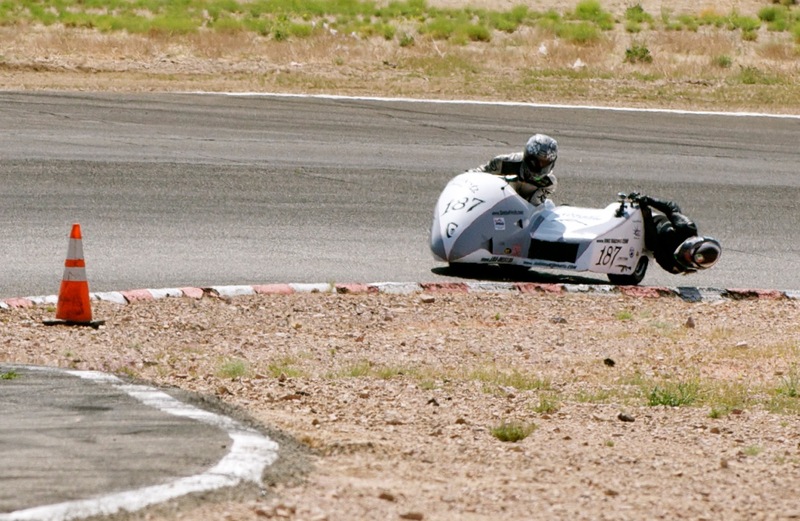 The SRA-West heads for the first time ever to Chuckwalla Valley Raceway. This will be even ground since no one in the series has been there, and it’s a tight track. Unfortunately, Gina will not be holding down the chair for me. Her day job has the most uncanny ability to call her away from the events that are the best challenges and best chances for us to win. Still, I have a stable of five passengers, and at least one of them will be able to answer the call. Be sure to check out the video of Sunday’s race. It’s forward facing so there isn’t much to see until the 7-minute mark when Becker finally assumes the lead, but there is plenty to watch from there. 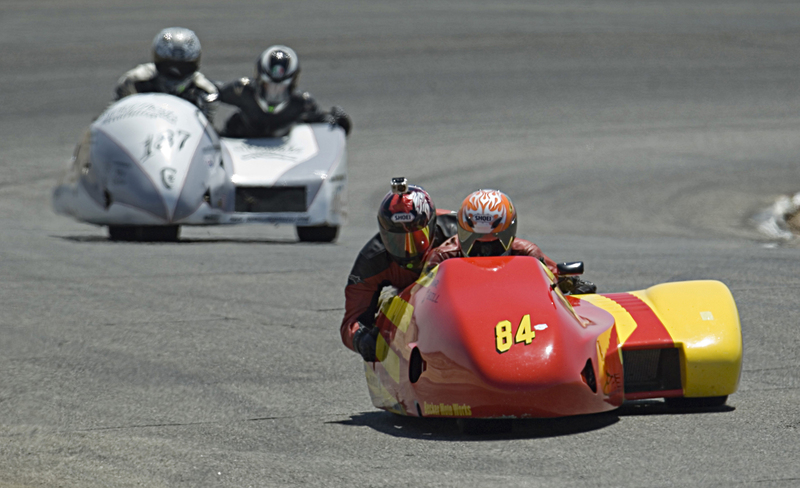 It also gives a good view of the odd lines sidecars have to use, and you can actually see the bike sliding and clearly hear the engine revving as the rear wheel keeps breaking loose. It was a thrill ride to be sure. Trying to not look hung over for the camera. Photo ROBERT DENSMORE.